President Trump blazed a trail to the White House talking about trade. He has even credited his criticism of America's trade deals as a major reason he's now commander-in-chief. Trump continues to beat the drum, like tweeting on Nov. 14 that his attendance at a conference in Asia "will lead to FAIR TRADE DEALS, unlike the horror shows from past Administrations." But a year since his election, Trump's top trade threats haven't come through yet, though his administration has become more protectionist by slapping tariffs on countries left and right. Trump would undoubtedly put NAFTA, the trade pact between the U.S., Canada and Mexico, in the "horror show" category. True to his word, his administration has started to renegotiate the deal with America's southern and northern neighbors. Round 5 of the NAFTA talks began on Friday in Mexico City. But negotiations aren't going well: Round 4 ended with sharp rebukes from Canadian and Mexican leaders toward Trump's top negotiator, Robert Lighthizer. He hurled criticism back at them. Little progress has been made on key issues, such as how and where cars are manufactured in North America. Trump routinely threatens to withdraw from NAFTA. Relations have been rocky for other reasons. The U.S. just won a contentious trade battle over tuna imported from Mexico. The Trump administration also hit Canada with tariffs as high as 18% on softwood lumber. On top of all that, the U.S. and Canada are also in a bitter dispute over American aerospace giant Boeing's trade complaint against Canadian rival Bombardier. Trump lauded Chinese President Xi Jinping during his visit to Beijing last week, tweeting that Xi "is a highly respected and powerful representative of his people." But in the 10 months since Trump took office, not much has changed for U.S.-China trade relations. Trump did sign $250 billion of deals while he was in China across industries such as energy, technology and aviation. But some are nonbinding, meaning the companies involved don't have to stick to the terms of the deal. And one agreement for China to buy $37 billion of Boeing jets may not be new. In 2015, Xi announced a $38 billion deal when he visited Boeing's plant in Washington state. More broadly, Trump didn't expand market access for U.S. companies in China, nor was there any word about the U.S. investigation into Chinese intellectual property theft, something U.S. businesses say is a major problem. Trump also completely reneged on a campaign promise to label China a currency manipulator. During his campaign, he cited China's currency manipulation as a key reason the U.S., in his view, was losing in trade to China. But Trump never did label China a currency manipulator -- saying publicly he wouldn't because he wants China to help with the North Korea nuclear threat. Trump has gotten tough with China in some respects. His administration has slapped tariffs on Chinese goods, such as aluminum foil, plywood, tool chests and other items. However, those are relatively minor issues compared with intellectual property theft and dumping of major commodities, such as steel. TPP is coming back -- without the U.S.
One of Trump's first actions as president was to withdraw from the Trans-Pacific Partnership, a sweeping trade agreement with 11 other nations meant to lower trade barriers. At the time, many considered TPP dead. But it made a surprise comeback this week. During Trump's Asia trip, trade ministers from all other TPP nations -- which include Mexico, Canada and Japan -- agreed to "core elements" of TPP. Talks will continue into next year. Trump and his trade team aren't participating in the new talks. They prefer to sign one-on-one deals, also known as bilateral trade agreements. Trump argues that bilateral deals are easier to enforce compared with major multinational ones. Arguably Trump's biggest trade promise has been his vow to lower the U.S. trade deficit. Trump says a trade deficit is like losing money. 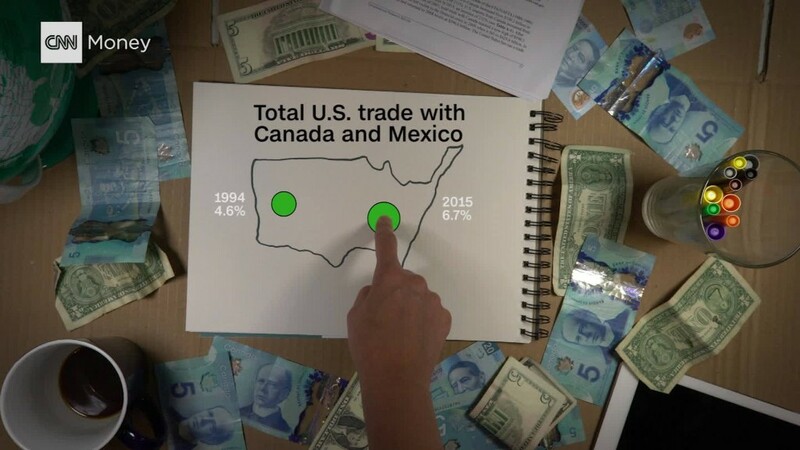 Trade experts say a trade deficit is not at all like losing money, nor is it an accurate reflection of the benefits and costs of a trade deal. 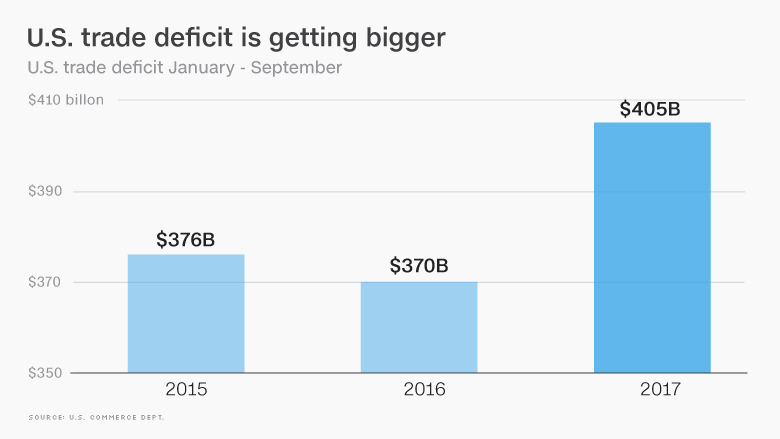 So far this year, the U.S. trade deficit is $405 billion. That's higher than the same period last year ($370 billion) and 2015 ($376 billion), according to Commerce Department figures from January to September. That does not mean the U.S. lost $405 billion. It means American businesses and consumers imported more than they exported, which is in line with a consumer economy. Through the first half of this year, the U.S. trade deficit with Mexico and China also got bigger. It would be hard for Trump to reverse those years-long trends overnight, but some experts argue it might be nearly impossible for him ever to lower the trade deficit without harming U.S. workers. Many U.S. factory jobs depend on cheap imports of parts, like tubes, wheels and screws, to stay in the United States. If Trump makes those imports more expensive, companies will have to raise prices, which would likely result in fewer sales and jobs. The Trump administration launched two controversial trade investigations earlier this year that have an uncertain fate. The Commerce Department is determining whether imports of steel and aluminum pose a risk to U.S. national security. If the investigations find there is a national security risk, Trump can apply tariffs on all steel or aluminum imports from around the world. He can also raise tariffs as high as he wants. A former Clinton administration official dubbed the so-called Section 232 investigation a "big sledgehammer." Trade experts say the investigations could risk a trade war in which the U.S. slaps tariffs on other nations and they retaliate. Commerce Secretary Wilbur Ross said in the spring that he aimed to have the investigations finished by June. But they've been put on hold. Trump told The Wall Street Journal in July that he wanted to repeal Obamacare, pass tax cuts and maybe get an infrastructure bill done before he returned to the investigation. --CNNMoney's Jethro Mullen and Daniel Shane contributed reporting to this article.